The new generation SIMATIC HMI Panel PC Ex NG has been specially developed for use in the pharmaceutical, chemical and life science industries, but can also be used in many other areas since it satisfies the requirements for operator control and monitoring directly in hazardous areas. Due to the 22" and 24" display diagonals, these devices are ideal for showing plant and process information provided from systems such as PCS. 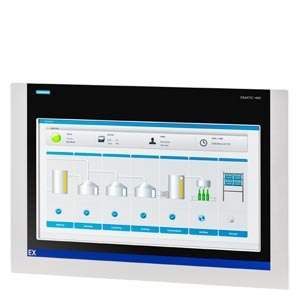 A modern Intel ATOM E3845 Quad Core processor is used with this SIMATIC HMI Panel PC Ex NG. The SIMATIC HMI Panel PC Ex NG has been specially developed for use in the pharmaceutical, chemical and life science industries, but can also be used in many other areas since these devices satisfy the requirements for operator control and monitoring directly in hazardous area. These new HMI devices for hazardous areas are neither installation nor image compatible with other SIMATIC HMI and SIMATIC HMI Ex devices. SIMATIC WinCC is executable. All devices can be immediately delivered as work stations ex factory. Various enclosure mounting types (pedestal, wall or gantry mounting), mounted keyboards in various language variants and other accessories are available for this purpose. Components are selected directly with the configurator as for SIMATIC IPC.